Formerly known as Colon Cleanse Syrup. This dynamic formula encourages normal bowel function and supports the intestinal system as the colon clears waste from the body. When the bowels move slowly, toxins can increase in the blood stream resulting in less than optimal health. 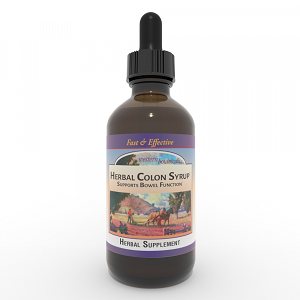 Herbal Colon Formula Syrup is a natural supplement supporting optimal bowel function but more gentle than the capsule form. Fig Syrup, Prune Syrup, Fennel seed, Senna leaf, Wild Cherry bark, Ginger root, Orange peel, Turkey Rhubarb root, Cascara Sagrada bark, Pure Maple Syrup, Vegetable Glycerine.